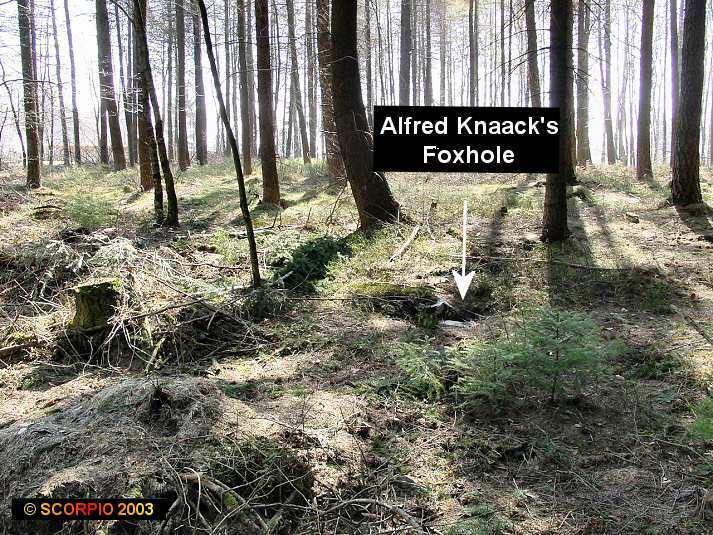 ALFRED KNAACK FOUND THE FOXHOLE HE DUG 59 YEARS AGO! Alfred F.Knaack was with the 9th Infantry Division, 60th Regiment, Company L, 4th platoon, 3rd Mortar. He fought in the Huertgen Forest during September and October 1944 and was one of the lucky ones who was not killed. "We were firing support for another company that was trying to advance. 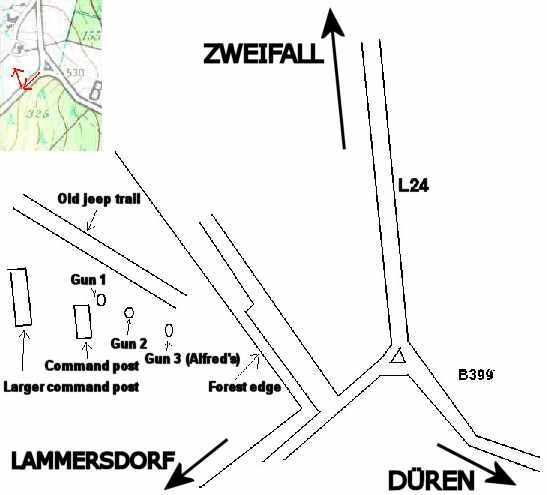 No.2 gun was doing the firing, I was in the bunker at my gun, No.3, with the telephone relaying fire orders to No.2. Suddenly the guys on No.2 said they were out of action and I was ordered to put my gun in play. I had just fired five rounds and the order was for 5 more same place. So I got 5 more ready and had dropped two and had the next two in my hands ready to drop when it happened. Next thing I remember, I was flat on my back looking up except I couldn't see. My hands were numb but everything else seemed to work. Without thinking about falling shells I got up and walked back to my bunker. So this is what it's like to be a casualty. In a way it was a relief, nearly everyone who is under fire gets it sooner or later." Until he was nearly 70, Alfred had never spoken about his war experiences. Then in the early 90's, one of his sons gave him an old computer, and for some reason, this inspired him to start writing. 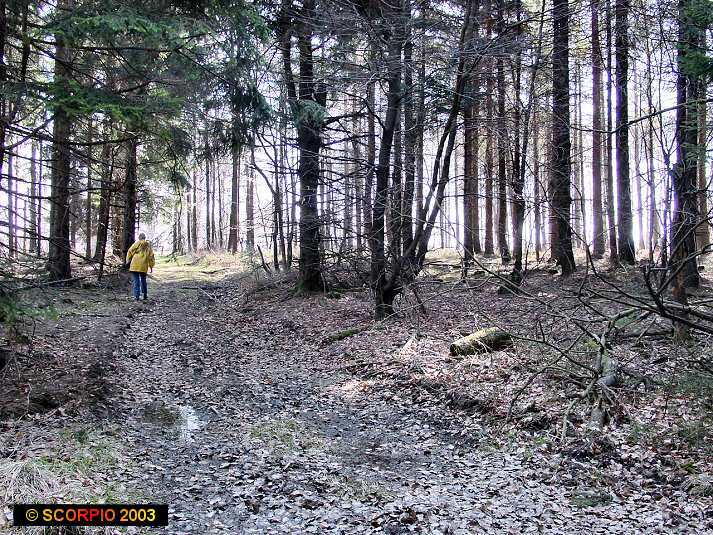 In March 2003 he decided to make the trip to Europe and visit his old battle ground in the Huertgen Forest. 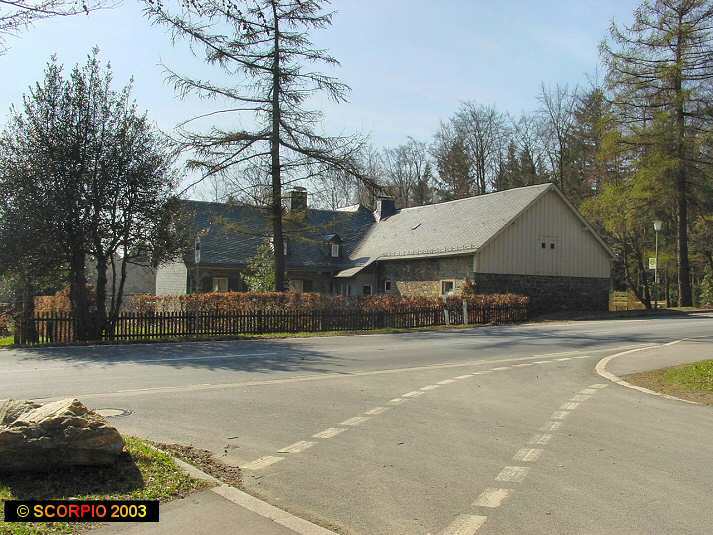 With the help of Manfred Klinkenberg of the Hürtgenwald Museum, Alfred and his son, John, and his nephew Jim Mitchell, where guided to the area where Alfred got wounded. 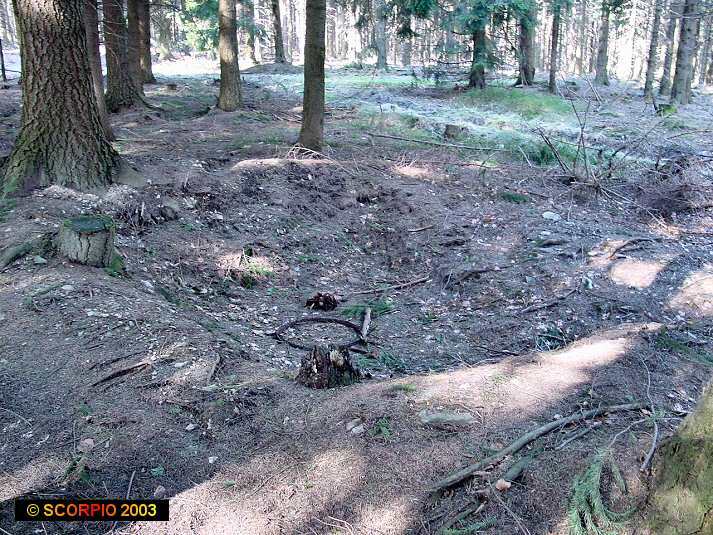 A small trail lead into the woods and amazingly but true, one hundred yards further to the left of the trail, Alfred found his foxhole (No.3 gun) and the foxholes of No.2 and No.1 guns. 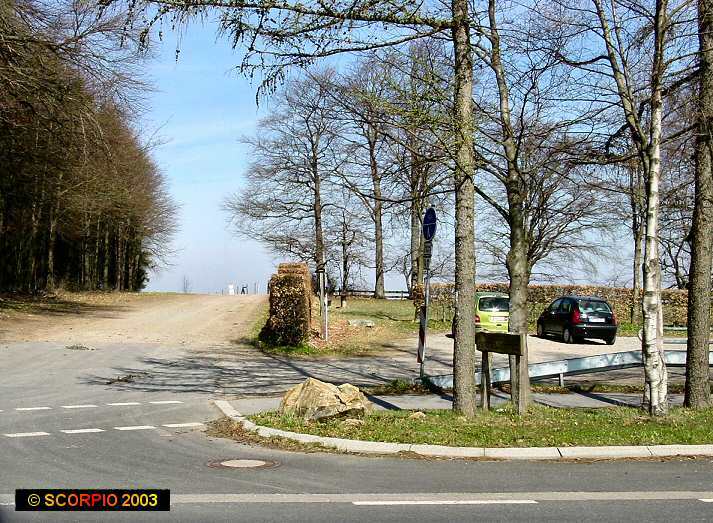 Also two square depressions where once the command posts were located could still be seen. 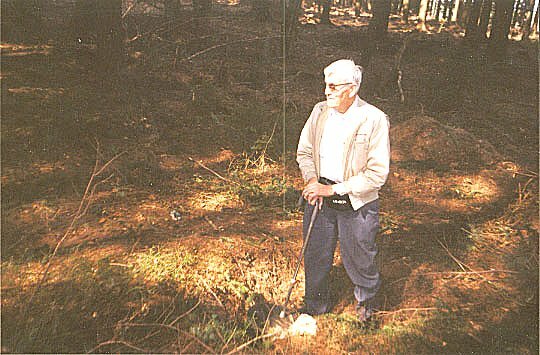 Alfred F. Knaack standing in his foxhole, he dug 59 years earlier. This proves that Alfred sure knows how to dig a foxhole! This story inspired me and my family to visit the area ourselves. A few e-mails back and forth with Alfred's son and his map below, made it possible to pinpoint the exact location. 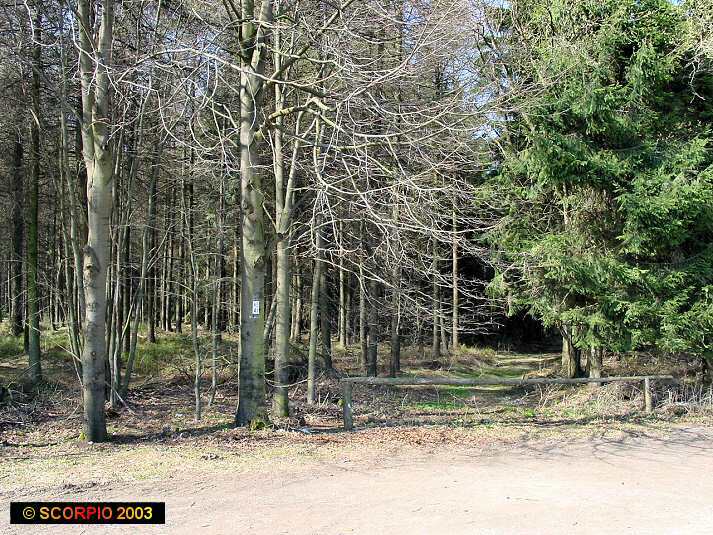 Entrance of the woods, former jeep trail. 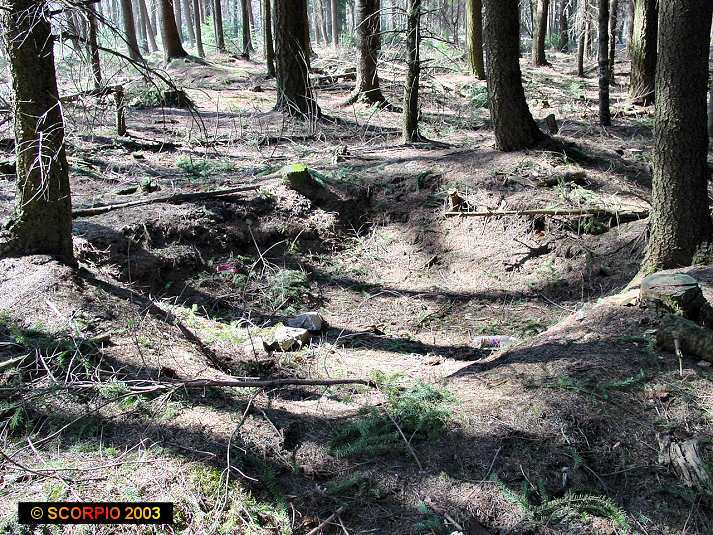 Woods near Alfred Knaack's foxhole. 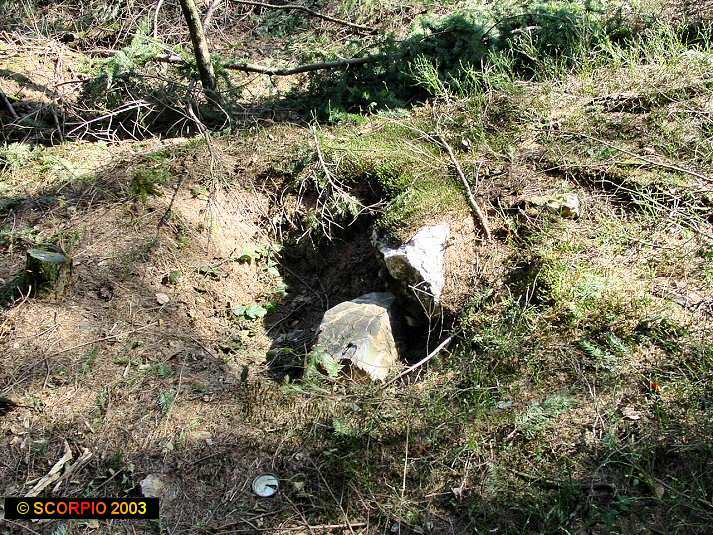 Alfred Knaack's foxhole in 2003. Click here to read the story written by Jarett C. Bies and published by Argus Leader on 7/6/2003. In remembrance of Alfred Fred "Bud" Knaack.